Rosebud Indian Reservation is asking for help to rebuild homes that the homeowners are unable to complete themselves. See the below list—if you can volunteer or send gift cards, please contact Mary Bates at 740-509-1132. Damages are to the ceiling in the living room and the entryway to the bathroom. Mold appears to be on the lower portion of living room wall nearer to the floor. This may be an issue that was possibly occurring before the storm. Damage to ceiling in the living room and bathroom. Roof damage to soffit area on the East side. The covering for the deck pulled away from the house due to snow and ice load and high winds. Damage to ceiling of 2 bedrooms, kitchen and bathroom. Damage to ceiling in multiple areas of home. Also damage to exterior siding. Trailer with damage to living room, bathroom and sink area. C-Store turn, 2 buildings South of Head Start, House #209. Transitional house with ceiling damage to kitchen and living room. Trailer with ceiling damage to most of the home. Home has damage to be assessed after water recedes. Trailer with damage to ceiling. On Sunday April 14, tornadoes struck the southern United States, killing eight including two children in a car destroyed by a tree. Pastor Mark Braaten and a volunteer team from his church have deployed to help with clean up in Texas. Families in Vicksburg, MS, and also Louisiana, have damages. The Midwest had a tornado in north central Ohio, Mansfield area. Damages are being assessed at this time. As storms continue across the United States, I am thankful for our NALC congregations and their hard work, reaching out to families in need. Your help is needed: prayers, donations of emergency response supplies, volunteer teams and monetary support. Keep your prayers and donations coming! For more information, contact Mary Bates, NALC Disaster Response coordinator, 810 Main St., Caldwell, Ohio 43724 or 740-509-1132 or disasterresponse@thenalc.org. Mary Bates, NALC Disaster Response coordinator, reports the Nebraska flooding is historic, worse than the 1952 floods. Over 60,000 homes flooded in 29 communities. A U-Haul full of supplies has been loaded and is on its way to Pastor Bob Carlson at Faith Lutheran Church, Dannebrog, NE. Faith Lutheran Church, Dannebrog, NE is flooded. The pastor and most of the members’ homes are flooded. NALC Disaster Response is delivering emergency relief supplies; flood buckets, health kits, school supplies, Bibles and quilts. Our congregations are responding with donations of material goods, volunteer teams and lots of prayer. To support our families and the 29 flooded communities in Nebraska and the Great Plains Mission District, please send your donations to NALC Disaster Response, 2299 Palmer Dr. Suite 220, New Brighton, MN 55112. Contact Mary Bates for more information as to how you can help at 740-509-1132 or disasterresponse@thenalc.org. Rockport, MO, Dannebrog, NE, Westboro, MO and possibly Johnson, NE are affected. . . . Through local efforts here spearheaded by people in town, the first of three truckloads of materials were delivered into the Wood River region on Monday. The need is so widespread that it is hard to know where to even begin. 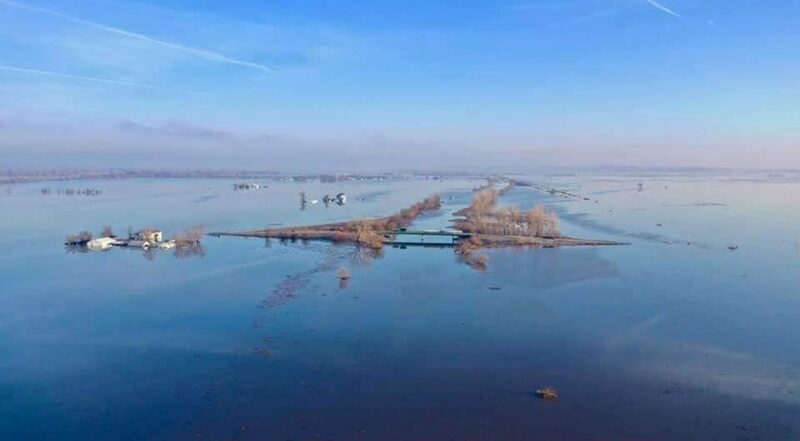 This photo is staggering – taken of Interstate 29 running down the Missouri River (fully a mile away from the road itself) south of Omaha, Nebraska. NALC Disaster Response stands ready to provide support for any of your congregations, families and communities who have flooded. If your church or any families have damages, please contact Mary Bates as soon as possible at 740-509-1132. If you would like to reach out to the larger community, let Mary know and we can transport flood buckets and other emergency relief supplies to your church for distribution. Over 60,000 families have been impacted by recent flooding and storms across the Midwest. NALC Disaster Response is providing support to our local congregations in Nebraska, Iowa, Illinois and Indiana due to recent storms. To donate, please send a check or money order to NALC Disaster Response, 2299 Palmer Dr., Suite 220, New Brighton, MN 55112. To donate flood buckets and other emergency relief supplies, contact Mary Bates at disasterresponse@thenalc.org or at 740-509-1132. Please keep our congregations and the thousands of families in your prayers. Your help is needed in Texas for Hurricane Harvey long-term recovery and also in North Carolina for Hurricane Florence long-term recovery. Together we can make a difference in a family’s life. Please don’t hesitate to share the love of Jesus and your time, talents and treasures. There is a massive amount of home rebuilding that needs done in the Houston area of Texas — volunteers are housed at Peace Lutheran Church and St. Paul Lutheran Church, Rosenberg, TX! For Hurricane Florence in North Carolina, NALC Disaster Response has established volunteer housing at Reformation Lutheran Church, New Bern, NC and also St. Matthew Lutheran Church, Wilmington, NC. Volunteers bring new hope to the many families who still don’t have homes. We rebuild lives after disasters one home at a time. For more information, contact Mary Bates, NALC Disaster Response coordinator at 740-509-1132 or disasterresponse@thenalc.org. Hurricane Florence made landfall on September 16, devastating thousands in North Carolina. Mary Bates, NALC Disaster Coordinator, assessed the need for donation centers and volunteer team housing, supporting local congregations in the impacted area to serve the larger community. Truckloads of water, flood buckets with cleaning supplies, rakes, shovels, garden hoses, more than 1,000 hygiene kits, 500 layettes/baby items, 2,000 quilts and Bibles, school supplies and pet food have been delivered to families in need from New Bern, NC to Wilmington, NC and sites in between by NALC Disaster Response. Volunteer teams for rebuilding homes are needed in New Bern, NC, Wilmington, NC and Rosenberg, TX (Hurricane Harvey long-term recovery), where on-going recovery is in process. Spiritual Christian care teams are needed with each team completing rebuilds, including clergy and laity, to minister to families as they return to their damaged homes; to pray with them and remind them that the Body of Christ is there for and with them in this difficult time. Volunteer teams will be needed throughout the next year and devastated families will need help for a number of years. Mary Bates is addressing the needs for the California wildfires and will post volunteer team needs on the NALC website as it develops. Donations of gift cards for building supplies for the volunteer teams to utilize on-site. Flooring is a significant need. Monetary donations may be sent to NALC Disaster Response. Monetary donations may be given online or sent to NALC Disaster Response; 2299 Palmer Drive, Suite 220; New Brighton, MN 55112-2202. Donate material goods to the NALC Disaster Warehouse, 810 Main St., Caldwell, Ohio, 43724 or call Mary at 740-509-1132; gift cards from building supply stores are welcomed! Schedule your mission trip to a disaster impacted area in 2018—contact Mary by email at disasterresponse@thenalc.org or 740-509-1132. Continue your prayers for those struggling to recover—God is with us always! Mary Bates, NALC disaster response coordinator, has established donation centers and volunteer housing through our congregations in each of the disaster impacted areas. To donate or volunteer in 2019 for any of these disasters, please contact Mary at 740-509-1132 or disasterresponse@thenalc.org. Through Our Savior Lutheran Church – Auburn CA, NALC Disaster Response is supporting response to the “Camp Fire.” California has had over 70 wildfires in 2018 and our congregations have been there to respond and provide support during the rebuilding process for families without homeowners insurance. Reformation Lutheran Church – New Bern NC and St. Matthew Lutheran Church – Wilmington NC are hosting volunteers for long-term recovery rebuilding. Adult and youth teams are needed. Donations of building supplies and furniture is needed. Long-term recovery rebuilding is on-going for the thousands of families who were impacted by Harvey in September 2017. Volunteers are really needed. Families are living in flood damaged homes as there are no other options for them. Local responses are taking place in Ohio, Michigan, Pennsylvania. NALC congregations in North Carolina have moved into long term recovery for Hurricane Florence families. Volunteers are needed to deliver furniture, to provide rebuilding of homes, and to minister spiritual Christian care. We are also collecting new toys for Christmas for the children who have lost everything. Through an LCMC congregation, NALC Disaster Response has delivered a truck load of emergency supplies to the Panama City area. Long term recovery rebuild teams are needed in Texas for Hurricane Harvey recovery — Peace Lutheran Church in Rosenberg, Texas will host volunteers throughout the winter months. California congregations have not been impacted by the wildfires, however, Our Savior – Auburn CA is reaching out to some of the families at Paradise. Please pray for the families who have lost loved ones. Mary Bates is scheduling volunteer teams, collecting donations of furniture and toys and gift cards — to donate, contact Mary at 740-509-1132 or disasterresponse@thenalc.org. The need will be on-going as we think about 2019! Flood Bucket Challenge Update: Thanks to your efforts, there is a box truck filled with flood buckets and relief supplies ready to go at Mary Bates’ direction. This means, however, that the warehouses are once again empty. With Hurricane Michael’s destruction now added to the mix, the need remains greater than ever and we will need to stock the warehouses again as quickly as possible. Our goal will be to continue to keep the supplies coming throughout the fall until there is no further need and the warehouses are full for next year’s hurricane season. *Caldwell Ohio has a large number of empty buckets at the warehouse, so contact Mary before you buy new ones. Please limit your material donations to the items listed above. No bottled water is necessary at this time. Have your congregations collect these items as soon as possible and deliver them to the National Disaster Warehouse in Caldwell, Ohio—contact Mary Bates for pick up options. Two-person driving teams are preferred. If you or your parishioners are interested, please contact Mary. Mary Bates continues to coordinate Volunteer Work Crews to our sites in the Carolinas, and she will be doing the same for areas affected by Hurricane Michael. Once again, especially now with respect to Michael’s aftermath, we need to be mindful that we do not send too many people too soon, so as to create a burden for local personnel. There is much work to be done over a long period of time: cleaning now, rebuilding later. With all this in mind, Mary will gladly work with you to schedule crews from your congregations. We will also need Spiritual Care Teams, including both clergy and laity, to minister to families as they return to their damaged homes: to pray with them and remind them that the Body of Christ is there for and with them in this difficult time. Please prayerfully consider how your congregations might help with this overall effort, and coordinate with Mary Bates at (740) 509-1132 or disasterresponse@thenalc.org. Please continue to pray for all those who have suffered the loss of loved ones, homes and property in the wake of these storms, and for those who continue to come to their aid. As search and rescue teams continue, help is needed with debris removal, especially chainsaw teams. NALC Disaster Response is resilient and we are reaching out with the love of Jesus to the thousands of families impacted by Hurricane Michael. Until volunteers are allowed to be on-site to help, send your monetary donations to NALC Disaster Response, 2299 Palmer Dr, Suite 220, New Brighton, MN 55112. NALC Disaster Response is assessing the damages caused by Hurricane Michael and stands ready to assist and support any of our congregations who have been impacted. If your congregation or any of your members have damages, please contact Mary Bates as soon as possible and we will provide assistance. If you have resources or can help in any way, also please let Mary know. Monetary donations should be sent to NALC Disaster Response, 2299 Palmer Dr., Suite 220, New Brighton, MN 55112. Continue to watch for updates. An update on our Hurricane Florence transition into long-term recovery will follow; volunteer teams are needed as we start the rebuilding process. Please pray for the families and their recovery from this devastating storm. Thanks be to God — He is good! Reformation Lutheran Church – New Bern NC is housing volunteers and has the donations center running smoothly. Thank you Pastor Alan Daughtery. St. Matthew – Wilmington NC is also housing volunteers and has the donations center up and running. Thank you Pastor Sam Zumwalt and Nancy Magruder. Over 70,000 people have registered for FEMA assistance, over 40 people have lost their lives due to Hurricane Florence, and now Conway, SC is flooding — evacuations initiated yesterday. Please continue your efforts to collect emergency relief supplies such as flood buckets and Bibles. Volunteers may contact me to schedule time at either location to assist people like Heidi: She is an elderly widow with two trees in her house. She has insurance and is very anxious, even fearful, that she will not understand her insurance agent when the company sends someone. She needs help and is afraid of strangers just showing up. NALC Disaster Response is providing spiritual care and helping her every day by checking on her and scheduling a volunteer to be present when the insurance company arrives. Thank you for your prayers for our families like Heidi. For more information on how to help the Carolinas Mission District, please contact Mary Bates disasterresponse@thenalc.org or 740-509-1132. Convocation gift cards are being used for Hurricane Florence — Reformation in New Bern, NC has 40 Congolese families especially who need assistance. Kids under the age of ten are preparing disaster relief kits. More kits are needed — especially school kits. Visit thenalc.org/nalc-disaster-response for a list of kit contents. Thanks be to God—he is good! Reformation Lutheran Church, New Bern, NC is housing volunteers and has the donations center running smoothly. Thank you Pastor Alan Daughtery. St. Matthew, Wilmington, NC is also housing volunteers and has the donations center up and running. Thank you Pastor Sam Zumwalt and Nancy Magruder. Over 70,000 people have registered for FEMA assistance, over 40 people have lost their lives due to Hurricane Florence, and now Conway, SC is flooding—evacuations initiated yesterday. Please continue your efforts to collect emergency relief supplies, such as flood buckets and Bibles. Volunteers may contact me to schedule time at either location to assist people like Heidi: She is an elderly widow with two trees in her house. She has insurance and is very anxious, even fearful, that she will not understand her insurance agent when the company sends someone. She needs help and is afraid of strangers just showing up. NALC Disaster Response is providing spiritual care and helping her every day by checking on her and scheduling a volunteer to be present when the insurance company arrives. Thank you for your prayers for our families like Heidi. For more information on how to help the Carolinas Mission District, please contact Mary Bates at disasterresponse@thenalc.org or 740-509-1132. Your help is needed! It is BAD — I am in New Bern, NC at Reformation Lutheran Church and it’s been seven days since Hurricane Florence made landfall. Homes are flooded, water is standing every where; in homes, on the streets, in churches. Rivers are rising (not receding), causing so much more flooding. The Carolinas Mission District needs you! 4. Schedule your youth and adult groups for long-term recovery rebuilding now — our congregational members need help repairing their homes. I ministered to a young mother last evening, as I was pumping gas in my NALC Disaster Volunteer t-shirt. She came to me crying and asked for $5 to buy milk for her baby. The volunteer with me, Ken Watson, gave her $20 and she profusely thanked him, only to find that the store did not have any milk on the shelves and she started crying again. I started praying with her and Ken started asking for milk: a few minutes later we found that Walmart just received a truckload — thanks be to God! Every road is closed due to water, every family needs prayer and the love of Jesus — will you help? 3. Volunteer housing is tentatively being scheduled for Reformation – New Bern NC and other sites to be determined. 4. Spiritual Christian care teams are needed — as families return to their homes devastated by the hurricane, they need to know they are not alone on this journey — we as the Church are there for them. 5. NALC Disaster Response is assessing need and evaluating case management/identification of families to be assisted in the long term recovery. 6. Volunteer teams from the eastern US is on standby/ready for deployment to help with clean up now and rebuilding later. 7. Monetary assistance, gift cards and other resources are available through NALC Disaster Response and the Bishop. NALC Disaster Response has now shipped two truck loads of flood buckets, health kits, bottled water and other emergency supplies to North Carolina; staging your donations at St. John, Statesville, NC and Faith Lutheran in Faith, NC. As the water recedes, the truck will go to Reformation Lutheran Church, New Bern, NC and St. Matthew, Wilmington, NC — volunteers are needed to help unload. I am also needing volunteers for spiritual Christian care and to start debris removal — to sign up, contact Mary Bates at disasterresponse@thenalc.org or 740-509-1132. More flood buckets and kits of all types are needed — please collect asap. Volunteers are needed — sign up today. Prayers are needed for our survivors, our pastors and our volunteers! There is a 9am teleconference Saturday to coordinate our resources and our needs — join us if you can! NALC Disaster Response has been helping in Texas, Florida, and Puerto Rico for over a year now, and hundreds of our volunteers have restored homes and hope. There continues to be many homes that need rebuilt, especially in Houston/Rosenberg area. Situations like this are expected to be common throughout the Carolinas in the wake of Hurricane Florence. Florence is being called a record-breaker, with widespread destruction anticipated. Please join us in praying for the safety of the hundreds of thousands in the path of this impending disaster. Much like Hurricane Harvey that struck the Houston area last year, Florence is expected to linger in the area for days, bringing record rainfall totals and producing historic floods that are likely to destroy and damage homes for hundreds of square miles. We are preparing for the worst: volunteers are needed for emergency response and then long term recovery rebuilding. If you can volunteer, contact Mary Bates at disasterresponse@thenalc.org or 740-509-1132. To donate flood buckets, health kits, school kits, Bibles and other supplies, please check the NALC collection points listed above. Please send monetary donations to: NALC Disaster Response, 2299 Palmer Dr. Suite 220, New Brighton, MN 55112. NALC Disaster Response is hosting two open teleconferences to provide an update on Hurricane Florence response. Monetary donations may be sent to NALC Disaster Response, 2299 Palmer Dr. Suite 220, New Brighton, MN 55112. 1. NALC Disaster Relief Coordinator, Mary Bates will complete an assessment of damages to our congregations, families and the larger community needs. 2. Distribution points for flood buckets, etc. will be established. Tentative points are: Advent Lutheran Church – North Charleston SC, St. Matthew Lutheran Church – Wilmington NC and Reformation Lutheran Church – New Bern NC (these are tentative due to unknown scope of damages). 3. Volunteer housing is needed for NALC disaster volunteers who are able to help with clean up and debris removal. 5. Mary will post updates daily until a Plan of Action for emergency response and long term recovery is developed. For more information, contact Mary at disasterresponse@thenalc.org or 740-509-1132. Please continue to pray for those in the path of Hurricane Florence – as the Church, we are here to assist and share the love of Jesus. NALC Disaster Response has a teleconference with the Carolinas Mission District and is staging emergency response for Hurricane Florence, one of the strongest hurricanes recorded. Sustained winds of over 140 miles per hour have caused South Carolina to issue mandatory evacuation orders for millions of people. As store shelves are emptied, NALC Disaster Response will be transporting Bibles, flood buckets, health kits, school kits, baby kits, and other emergency relief supplies to North Carolina, South Carolina and other areas as the need is identified. Mary Bates is posting an update daily. For more information, contact Mary at disasterresponse@thenalc.org or 740-509-1132. Please pray for the millions of families in the path of Florence.